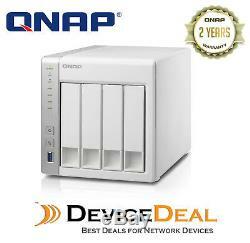 QNAP TS-431P 4 Bay Diskless NAS - ARM Cortex-A15 dual-core 1.4GHz CPU. All these apps (and more) are available at no extra cost. The dual-core TS-431P features three USB 3.0 ports and dual LAN ports, delivering outstanding multitasking performance to enhance your productivity & digital life and offering an ideal storage and backup center as a secure private cloud. Centralizes file storage, sharing and backup with excellent performance. Full NAS encryption using volume-based technology and hardware acceleration. Supports QmailAgent as a mailroom center and Qcontactz for centralizing contact information. Synchronize files between the TS-431P, computers, laptops, and mobile devices. Stream your multimedia library via DLNA®, AirPlay® & Chromecast. Build a surveillance center to safeguard your home and office. Dual-core processor delivers high performance. Equipped with an AnnapurnaLabs, an Amazon company Alpine AL-212 dual-core 1.7 GHz Cortex-A15 processor and 1GB DDR3 RAM, the TS-431P is a high-performance NAS for home, workgroups and SOHO users providing outstanding performance of up to 223 MB/s read & 172 MB/s write throughput. The TS-431P's enhanced hardware-based encryption and decryption engine provides transfer speeds of over 190 MB/s with AES 256-bit full NAS volume encryption, boosting system performance & security while ensuring the safety of sensitive personal data stored in the NAS. When used with a compatible 802.11ac or dual-band 2.4GHz/5GHz 802.11n USB Wi-Fi adapter, the TS-431P becomes an ideal media center with remarkably high speeds for transferring a large amount of files and streaming bandwidth-intensive multimedia. Figures may vary by environment. Transferring 32GB filecontinuously to NAS for 3 minutes. Block size: 64KB for SMB2.0. High Efficiency with dual LAN support. The TS-431P supports multiple port-trunking modes, enabling administrators to set up link aggregation to increase total data transmission potential. Failover and dual IP are also supported to ensure continuous system operations. Thanks to the intuitive user interface of QTS, your NAS experience is smarter, smoother and spectacular. Its modern flat design streamlines loading times, and the intelligent desktop allows you to find desired functions quickly, create desktop shortcuts or group shortcuts, monitor important system information on a real-time basis, and open multiple application windows to run multiple tasks concurrently, bringing greater working efficiency. QTS breaks the barriers of devices, platforms and geography to bring optimized cloud experiences to you. Create digital notes on your private cloud. You can also create sharing links to share documents in real time. Documents can also be encrypted to prevent unauthorized access, and snapshot backup is provided to retain different versions of documents from different time periods. With its importing/exporting and full-site backup functions, Notes Station supports backing up your documents to local or remote QNAP NAS. Note: Notes Station 3 will be available from QTS 4.3. QmailAgent - A mailroom center for your private cloud. It provides complete functionality for composing, reading and organizing emails. You can even attach files, photos and documents from the TS-431P when composing emails. You can use QmailAgent together with Qsirch, which supports searching through the. Eml files stored on the TS-431P, to make searching through and managing massive amounts of emails much easier. Note: QmailAgent will be available from QTS 4.3. Qcontactz - Easily manage huge amounts of contacts on the NAS. Qcontactz with the high-capacity TS-431P helps you centrally store and manage contact information for colleagues, business partners, families, and friends. Other features include: importing from Google® accounts, importing/exporting CSV or vCARD 3.0 files, automatic identification of frequently-used contacts, encryption for sensitive/confidential contact information, smart searching, and more. Qcontactz offers snapshot backups that enable you to revert to a previous version of your contacts list according to your needs. A companion app for Android phones and iPhone® is also available for easy access to contacts. Note: Qcontactz will be available from QTS 4.3. Well-rounded backup solutions to secure data. The TS-431P is a comprehensive centralized backup center for multiple files. The front panel USB port features a one-touch-copy function for you to instantly back up data on USB drives to the TS-431P or alternatively to back up data from the TS-431P to USB drives. A wide range of third-party backup software (such as Acronis® True Image and Symantec Backup Exec) are also supported to facilitate system backup and restoration. Learn more: Data backup & Disaster recovery. Disaster recovery solutions bring peace of mind. Hybrid Backup Sync consolidates backup, restoration and synchronization functions (using RTRR, rsync, FTP, CIFS/SMB) into a single app for easily transferring data to local, remote and cloud storage spaces as a comprehensive data storage and disaster recovery plan. Supported cloud services include Amazon® Glacier, Azure Storage, Google Cloud Storage, Google Drive, Microsoft® OneDrive®, Dropbox®, Amazon® Drive, Yandex® Disk, Box® and Amazon® S3/OpenStack Swift/WebDAV compatible services. Hybrid Backup Sync supports multi-version backup, flexible job scheduling, file compression to save storage space, and more. Learn more: Hybrid Backup Sync. In open network environments, business data may be exposed in a potential hack. The TS-431P provides numerous security options, such as encrypted access, IP blocking, 2-step verification, and more. Administrators can also control the access rights of each user to different folders, preventing unauthorized access to important files. The TS-431P supports AES 256-bit encryption, preventing sensitive business data from unauthorized access and breach even if the hard drives or the entire system were stolen. Cross-platform file sharing, centralized data storage. The TS-431P supports SMB/CIFS, NFS, and AFP protocols for file sharing across Windows®, Mac®, Linux®/UNIX® networks. Data, logs and ISO images of CDs and DVDs can be centrally stored on the TS-431P. Learn more: Cross-platform file sharing. Manage your files via the Internet. File Station brings conventional desktop-style file operations to web browsers, allowing you to upload, download, and manage files on your TS-431P wherever there is an internet connection. Supporting file extraction, folder creation, and smart search for files and folders, File Station also allows you to easily share files via unique URLs protected with reliable security features, SSL and password options. You can even directly browse and transfer files between the TS-431P and public cloud services like Google Drive, Dropbox®, Microsoft® OneDrive, Box®, Yandex® Disk and Amazon® Drive, open office files directly with a Google Chrome office extension, and also view your files on Google Docs or Office Online. Container Station LXC and Docker Containers inclusive. QNAP Container Station exclusively integrates LXC and Docker® lightweight virtualization technologies, allowing you to operate multiple isolated Linux systems on the TS-431P as well as download apps from the built-in Docker Hub® Registry. It supports container import/export, permission settings, and an Online Document app for directly viewing, editing and storing files of various types on your NAS (including Office documents, images and text files). An informative dashboard and flexible user interface guides you in managing multiple containers, allowing you to enjoy the playground of virtual containers with the TS-431P. A private cloud without constraints. In contrast to the limited storage space and potential security concerns of public cloud services, the TS-431P is advantageous for establishing a secure and large-capacity private cloud where you have full control over how your data is used and transmitted. The myQNAPcloud service allows remote access to files stored on the TS-431P, allowing you to play & share multimedia from the TS-431P or to conveniently check the system status from anywhere. File synchronization across multiple devices. Qsync turns your TS-431P into a safe, high-capacity data center for file synchronization. Any file uploaded to the TS-431P will be made available for all linked devices, such as computers, laptops or mobile devices. Qsync is especially useful for frequent travelers to manage files and always have the most up-to-date files on different devices. Qsync provides multiple ways for file synchronization and group file sharing, greatly enhancing the flexibility of team projects and collaboration. Comprehensive surveillance solution providing 24/7 security. Surveillance Station is a professional network surveillance Video Management System (VMS) that offers a user-friendly management interface, over 3,000 compatible IP camera models, and expandable IP camera channel licenses. It supports real-time monitoring, video & audio recording and playback with a wide range of customizable settings. You can also install the Vmobile app on your iOS® or Android devices to manage the monitored channels anytime and anywhere, or install the Vcam mobile app to turn your device into a network camera to instantly record to your TS-431P. The TS-431P offers 2 free IP camera channels and you can expand up to 25 channels by purchasing additional licenses. Photo Station makes photo sharing simple, and you can designate your own access right controls. With the Qfile and Qphoto mobile apps (for iOS® and Android), you can also instantly upload your new photos from your mobile device to the TS-431P. Build your home music library and enjoy music anywhere. Music Station helps categorize your music collection, and displays album covers to easily organize your personal playlists. Through the Music Station web player, you can enjoy your music anytime, anywhere with a few clicks. Thousands of local and global online Internet radio programs are also built-into the Music Station for you to enjoy. Stream via Airplay® and DLNA for music throughout your home. Listen to your favorite songs streamed from iTunes Server. Or play music via web browsers on your PC. Listen to your music on mobile devices using the Qmusic app. Enjoy media freely with multi-zone multimedia control. Use your TS-431P as a multi-zone multimedia system to fill every corner of your house with your choice of media. You can centrally manage and stream photos, music and videos from the TS-431P to different rooms from a single device using Bluetooth® & USB devices connected to the TS-431P (music streaming only), DLNA®, Apple TV® and Chromecast. Every room member in different zones can enjoy the convenience and simplicity for media playback and multimedia storage. The TS-431P is also a powerful streaming machine with DLNA®, Roku®, Amazon® Fire TV, and Google TV support with the support of Plex Media Server. To stream multimedia via Chromecast, you must first install the multimedia extension pack from the QTS App Center. AnnapurnaLabs, an Amazon company Alpine AL-212, 2-core, 1.7GHz. SATA 3.5"/2.5" 6Gb/s HDD/SSD ; Hot-swappable. 3 x USB 3.0 port (Front x1; Rear x 2). System Status, HDD, USB, LAN. Dimensions (H) x (W) x (D). 169 x 160 x 219 mm 6.65 x 6.3 x 8.62 inch. Net: 3 kg (6.61 lbs); Gross: 4.3 kg (9.48 lbs). 0 - 40C / 32104°F. 595% non-condensing, wet bulb: 27C. AC adapter, 90W, 100 - 240V. HDD standby: 11.65W In operation: 26.7W (with 4 x 1TB HDD installed). Operating low speed: 19.5 dB(A). 1 x 12 cm smart fan (12V DC). Testing Environment: Refer to ISO 7779 ; Maximum HDD loaded ; Bystander Position ; Average data from 1 meter in front of operating NAS. Designs and specifications are subject to change without notice. Device Deal ships orders by Local & international couriers, including Australia post, Fast way couriers, DHL, TNT. (1) How long will it take to my area? The Processing Time is the time of gathering up all the items and packaging. They are door to door service. If your order items' total weight is less than 45 kilograms, you'd better choose Express, because it's fast & convenient. (2) Are the packages insured? If any missing issue arises, we will reship your order immediately. (3) How can I trace my order? 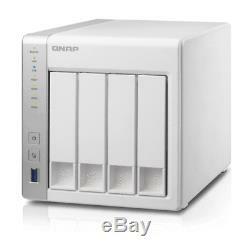 The item "QNAP TS-431P 4 Bay Diskless NAS ARM Cortex-A15 dual-core 1.4GHz CPU" is in sale since Friday, September 23, 2016. This item is in the category "Computers/Tablets & Networking\Enterprise Networking, Servers\Other Enterprise Networking". The seller is "device-deal" and is located in Melbourne. This item can be shipped to Australia, North, South, or Latin America, all countries in Europe, all countries in continental Asia, New Zealand.